Recorded in Suffolk, Co. Durham, St. Lucia & Jamaica 2007-2009. WARNING: Extreme Dynamic Levels. Listeners experience may change during playback! "wild track: Sound recorded during production without picture." Russell Haswell returns with a complete departure from his real-time computer generated improvisations (‘Live Salvage’ & ‘Second Live Salvage’). 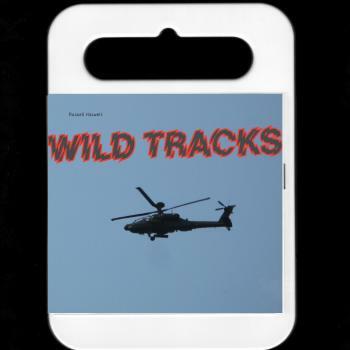 WILD TRACKS is a collection of ‘deliberate recordings’ made with other multi media / film projects in mind. These recordings do not contain any overdubs or compression, and document a wide variety of audio experiences. Taking you to a blowhole in Jamaica, inside an ant colony and to the entrance of wasp nest in Suffolk, on a helicopter ride in St. Lucia, two waterfalls in County Durham, as well as the sound of freshly fallen snow, flies being electrocuted and contributions from various military tactical airlift planes, air defence fighters and attack helicopters. The recordings on WILD TRACKS were realised using a variety of techniques including using hydrophones to record falling snow, recording gamekeepers many fields away with a parabolic dish, as well as binaural, ‘near-field’ & ‘direct’. At Editions Mego, we understand this to be the first commercially released audio CD to be packaged in a KIDZBOX™ containing a full colour A2 poster with photographs and detailed recording notes. Unlike any other release this season!